Liverpool could be set to face one less attacking threat when they take on Hoffenheim in their upcoming Champions League playoff clash. The Reds face a tough task up against the German side, who finished fourth in the Bundesliga last season, as they look to secure a place in the group stages of Europe’s elite competition. Jurgen Klopp’s men will compete away from home in the first leg on August 15, before welcoming their opponents back to Anfield eight days later. 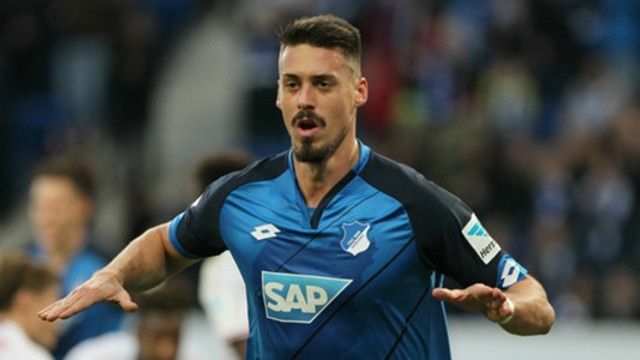 A highly-rated Hoffenheim attacking force could be without a key component, however, with star striker Sandro Wagner having recently suffered an ankle injury against Bologna, per German outlet Kicker. The 29-year-old scored 11 goals and registered two assists in Germany’s top flight last season, as well as breaking into the German national team for the first time. Wagner proved to be a prominent figure in a Hoffenheim team, led by 30-year-old manager Julian Nagelsmann, that went unbeaten at home in the league over the 2016/2017 campaign. His absence for the opening leg at the Rhein-Neckar-Arena would be a significant boost for the Reds in terms of perhaps giving them a license to push more men forward at times, not to mention giving the likes of Joel Matip and Dejan Lovren one less problem to deal with. Liverpool do face a noteworthy injury problem of their own, though, with Adam Lallana having been ruled out for up to three months with a thigh injury.